Photogeology and Regional Mapping covers the geological interpretation of aerial photographs, the compilation of the interpretations on to maps, the use of aerial photographs in the field, and the use of aerial photography for the production of the final geological map. This book is organized into 10 chapters and starts with an introduction to the aerial photograph. The subsequent chapters deal with the properties of the aerial photograph, including the scale, parallax and their difference. These chapters also survey the process of stereoscopy, the stereoscopic vision, pseudoscopic vision, and setting up the aerial photographs. These topics are followed by discussions on interpretation of the aerial photographs encoded into a map. 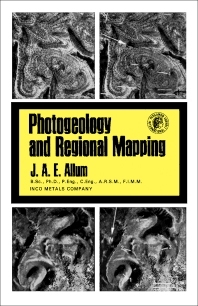 Other chapters describe the production of the photogeological map and field mapping with the use of aerial photographs. The last chapters consider the compilation of the encoded aerial photographs made into maps and the photogrammetry for geologists that explains the minor control plot, detail plotting, measurement of height differences using a stereometer. This book will be of value to geologists.